It’s fascinating to see how history or in this case, QMJHL playoff pairings, repeat themselves. Very often, hockey rivalries are born through geographic proximities like the Rouyn-Noranda Huskies and Val d’Or Foreurs who are separated by a mere 106 kilometres. It takes less an hour for the Drummondville Voltigeurs and Victoriaville Tigres to face off against each other. 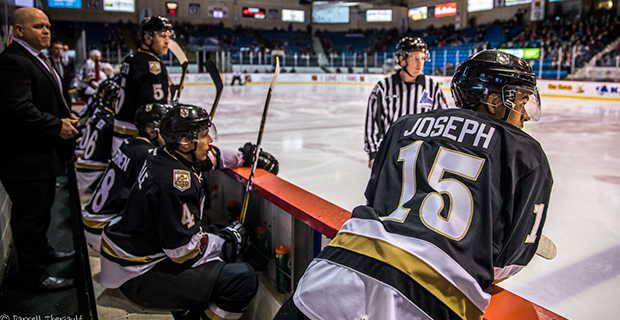 A more recent duel has been brewing between two complete opposites, the Charlottetown Islanders and Blainville-Boisbriand Armada. Separated by close to 2,000 kilometres and a 12-hour bus ride, the two franchises play in different divisions and meet up during the regular season on just two occasions. But for the second straight QMJHL post season, Charlottetown and Blainville-Boisbriand will face each other in the semifinals with a chance to advance to the President’s Cup final on the line. The Armada finished the regular season in top spot with 107 points (50-11-4-3) and were expected to do well in the postseason so it’s no surprise they are still standing. On the other hand, the Islanders had a decent year with a 37-24-7-0 record which was good enough for third place in the Maritimes Division and ninth overall in league standings. Who knows if the Islanders were holding back during back during their 68-game schedule but they sure have been impressive in their first two playoff rounds. In mid to late March, Charlottetown knocked off the #8 Quebec Remparts in an exciting seven-game series that had more twists and turns than a ride along Nova Scotia’s Cabot Trail. Jim Hulton Islanders GM and head coach readily admits that his squad had a lukewarm beginning but progressed with each game starting with the Quebec series. “Our game has grown and improved with each game,” said Hulton who is in his third year with the club. After taking a 3-2 series lead on home ice, Charlottetown headed to Quebec City for Game 6 in which the Remparts prevailed to tie things up at three games apiece setting up a one-match showdown. The Islanders ended up silencing a crowd of 8,121 spectators at Quebec’s Centre Videotron with a one-sided 8-3 victory and series win to earn a spot in the second round against the #4 Halifax Mooseheads. “Winning Game 7 against the Remparts was a huge confidence builder for our team,” Hulton said. Hulton and his coaching staff did their best to prepare his players to compete and ultimately defeat the Mooseheads which featured a talent laden line-up with five NHL draft picks and four pro prospects who are expected to be selected at this summer’s Entry Draft. But the unexpected happened with the underdog Islanders sweeping Halifax in four straight games. The series was pretty one-sided in the Islanders favour with one contest going to overtime. “We anticipated a long, gruelling series against an excellent Halifax team, we were very pleasantly surprised to win four straight,” said Hulton, who has also served as a head coach in the OHL and NHL assistant. It’s obvious the Islanders have not been able to get this far without the strong play and leadership of several players. Team captain and 2017 Arizona Coyotes first round pick (23rd overall) Pierre-Olivier Joseph has been logging tons of ice time for a team that has nine rookies. Hulton has also relied on quality goaltending from third year netminder, Matt Welsh who is tied for most wins (8) by postseason puck stoppers. In Round 3, Charlottetown will sail back into shark infested water when they meet Blainville. The Armada defeated the Islanders last spring in five games with Hulton and company looking for a much better result this time around. In his team’s case, Hulton is hoping that history does not repeat itself and the outcome will be different this time around.